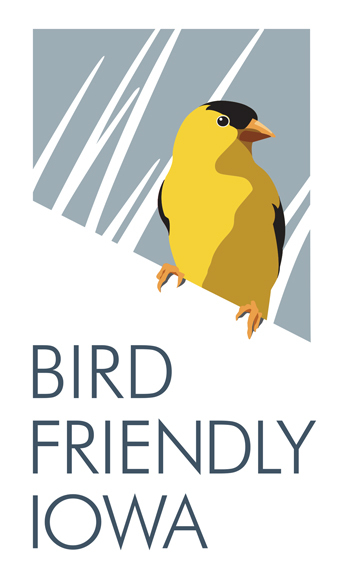 The flagship outreach and action program of Bird Friendly Iowa is called "Bird Friendly City", similar to the Arbor Day Foundation's "Tree City USA" program. Other states have recently initiated programs called "Bird City" or "Bird Town" programs, with "Bird City Wisconsin" being recognized as the national leader. Eventually this first phase will be expanded to include other types of Iowa communities such as counties, campuses, and farms. As awareness and action across our landscape grows, we should see a corresponding increase in birds to watch. Each type of entity has criteria to be met for recognition including advanced criteria for a "high flyer" status providing even greater protections of birds. Review the critera for cities on the BFI website. Engage your community leaders and work with your friends and neighbors to get your town designated as bird friendly. Let's fill in the map and show people that Iowa is a great place to live and enjoy birds. As a small start-up, Bird Friendly Iowa is in need of funding. Please donate as you can through the IOU donation page by selecting partnerships.